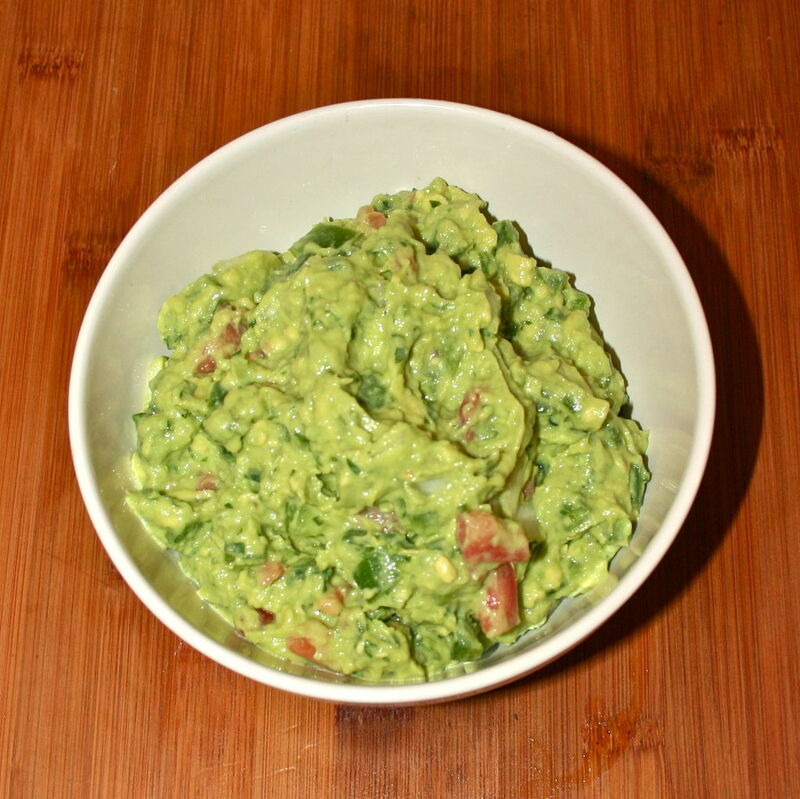 Guacamole is great; it's easy, vegan, gluten-free raw food that's delicious and healthy too! First remove the skin and pits from your avocados, then mash together in a large bowl until smooth. Avocados are ripe when the flesh beneath the thick skin yields to the touch of your fingers. When buying a bag of them, not all will ripen in unison and while brighter green avocados tend to be too young and the darker more brown or even purple-looking avocados are perfect; but looks can be deceiving, gently squeeze them to be certain. Chop your white onion and tomato into small cubes. Mince the cilantro finely and then set aside with the onion and tomato. For 3-5 avocados, either use one small tomato and onion each or use half of one large each. Use half a robust bunch of cilantro or the whole thing if the herbs are wilting or the bunch is smaller. If you are only using a couple of peppers for a small batch of guacamole you won't need gloves, however cutting jalapeños or other hot peppers can inflict serious injury if you are not careful. Use discretion in handling them. I had been using peppers in small quantities for years when I one day decided to up the heat and add more - and since they were in season and cheap at the grocery store I decided to make guacamole and two types of salsa for a company pot-luck at Christmas. I minced a large bag each of jalapeños and serrano peppers bare-handed. Didn't notice a problem until thirty minutes later - pot was bubbling on the stove and all of a sudden my hands started burning (particularly the left one as the knife-holding hand didn't touch many peppers) - burning so strongly that it was as if I had submerged them in a pot of sulphuric acid! Long story short, nothing really helps (there are many remedies out there, but time/patience is the only effective one) so wear gloves. Mix the tomato, onion, cilantro and jalapeños into your guacamole. Add the juice of one small lime or half a large lime (about 1/4 cup) and a pinch of sea salt. Mix again and serve - goes well with blue corn tortilla chips. When I was on a raw food diet, guacamole was one of my favourite dishes - try dipping carrot chips instead of regular ones or using cucumber slices or other veggies as a healthier alternative. Just wanted to point out that if you add the lime juice at the beginning, immediately after mashing the avocado, it will prevent the avocado from starting to turn black. It's the citric acid that does it.